As a recent volunteer dog walker, I heartily approve. The cleat designs are being posted with the hashtag #MyCauseMyCleats. You can see the search results for that hashtag here. You can also learn more about the participating players and their respective charities here. Meanwhile, I’ll have an ESPN piece later this week on two of the designers who worked with Nike-affiliated players to create their cleats. It should run on Friday. 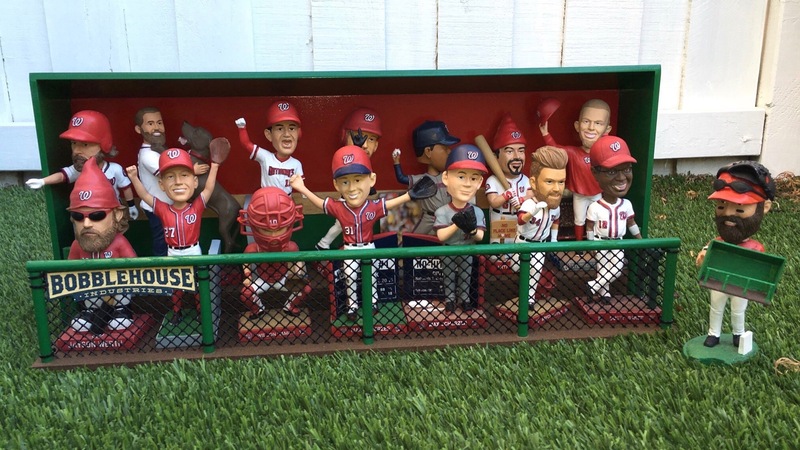 Uni Watch Holiday Gift Guide: My annual holiday gift guide will be up today on ESPN, featuring all sorts of cool stuff relating to uniforms, logos, and sports visuals (including the excellent bobblehead “dugout” and other custom bobble environments sold by Bobblehouse Industries, shown above). Check it out here. Baseball News: I’m a big fan of videos that show how things are made. Here’s one for baseballs (from Ronnie Poore). … New uniforms are coming for South Carolina. … A recent episode of the Trip to the Mound podcast (34 minutes in) discussed stirrups and the Big Red Machine during the 1970s (from Michael Ortman). NFL News: Byron Maxwell is known for wearing longer sleeves. His current team, the Dolphins, wore throwbacks this past weekend, and it looks like Maxwell had his sleeves customized (thanks, Preston Feiler). … The Vikings and Cowboys will play a Color Rush game on Thursday. … Snoop Dogg is not a fan of the NFL’s strict uniform policy, particularly regarding players who have different endorsement deals (from Phil). … I really enjoyed a recent feature story on Randall Woodfield, who was drafted by the Packers in 1974 and took part in their training camp that year. He later became the I-5 Killer and may have killed up to 44 people in the Pacific Northwest in the late 1970s and early 1980s. One of his trademarks was that he’d wear a “strip of athletic tape over the bridge of his nose, in the manner of a football player at the time” during his attacks, a detail that helped one of his surviving victims identify him. … Eric Dickerson wore No. 29 throughout his NFL career, but the Rams gave him a No. 25 jersey after they drafted him in 1983. He wore No. 19 at SMU (from Brian Wulff). 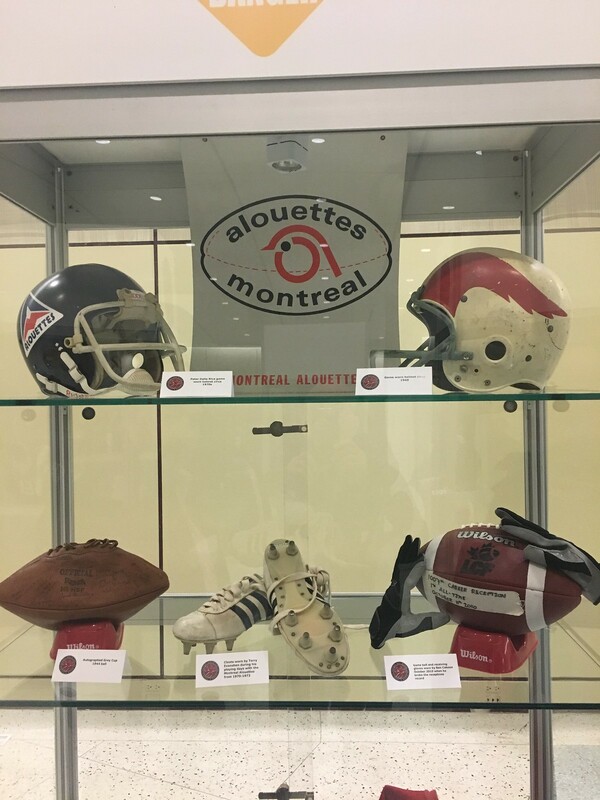 … Ted Arnold went to the Grey Cup in Toronto on Sunday and took photos of uniforms and equipment displays for the Montreal Alouettes, Saskatchewan Roughriders, BC Lions and Hamilton Tiger-Cats, along with a case of Grey Cup rings. 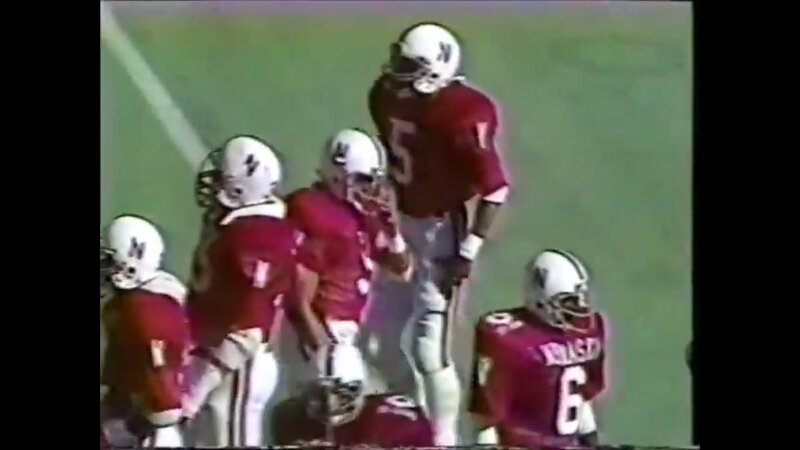 College Football News: Nebraska wore two different jerseys by two different manufacturers in the 1980 Sun Bowl. Photos and film of the game is hard to find, but here’s another shot of the game, and a look at the Champion-branded jersey (from Brett Baker and Patrick Thomas). … On a related note, Georgia Tech and Texas Tech went gold-vs.-red in the 1970 Sun Bowl (from Patrick Thomas). … Virginia Tech wore 42 different helmets during the Frank Beamer era from 1987 to 2015. The coach discussed some of his favorites (from Phil). … We’ve seen this before, but here’s an interactive site that breaks down all of Oregon’s uniform combos during the Nike era over the last two decades (from David Cline). Hockey News: Anders Nilsson of the Sabres has a rainbow flag on the back of his mask. Earlier this year, Nilsson was one of the Oilers that wrapped their sticks in Pride Tape (from @zubazshorts). … Here’s a good ranking of the road jerseys in the WHL. A few teams look pretty decent, in my opinion. College Hoops News: Illinois wore throwbacks last night (from Erik Spoonmore). … San Diego State wore N7 unis on Monday (from @noahpeets). … New white alternates for Maryland. It will be the Terps’ fifth uniform in eight games this season (from Matt Shevin). 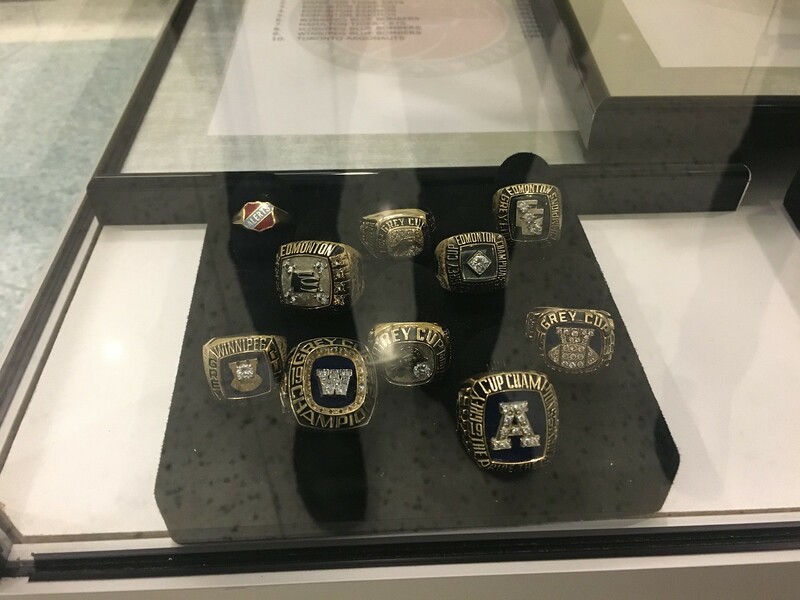 … Auburn wore a number of different uniforms from 1998 to 2004 (from Clint Richardson). … UNC has an archive of sports T-shirts (from @F3Ventura). … Fans will vote on whether Dominican will wear white or black unis, as in Light Side or Dark Side, for Star Wars Night on December 4 (from Brandon Davis). Love that the title of the WHL ranking is “Stupid WHL Jersey Post I Promised Tom I’d Write.” Shows more honesty than most list ratings. The ranking technically should be for “dark” jerseys in the WHL, not “road” jerseys. -WHL teams wear dark jerseys at home until Christmas. After Christmas, they switch to white jerseys at home for the rest of the season. Breathe Right strips weren’t invented until the early 1990’s,well after the i-5 killer, but was Woodfield wearing an early homemade version of it? The article only mentions a band aid or piece of tape. Used for function, or style? Was this even a thing in sports before the Breathe Right was invented? You guys are right. I changed the wording. Love the 1970 Georgia Tech and Texas Tech helmets, with the logos looking great. Those stars on the Texas Tech helmets must have been difficult to earn. Most of their players have less than a handful. Love the baseball how-its-made video. Love the fact that every baseball is still hand stitched. I assumed that a machine somehow just stitched them all. Glad to see there is still a level of craftsmanship involved in the process and it’s not just spit out of some machine from start to finish. Don’t know why, but it makes me appreciate a baseball more now every time I will hold one in my hands. 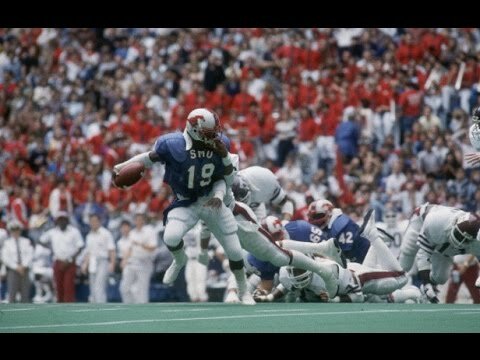 I always wondered if the bowl game didn’t supply the jerseys with the game logos back then. It seems like quite a few of the games would hook up with a supplier and provide the teams with something different (I vaguely recall teams in the Liberty Bowl getting different jerseys from Sports Belle). 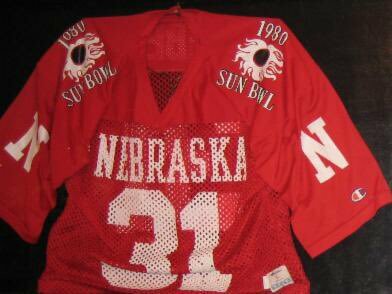 I suppose for Nebraska they let the players choose between their normal jersey and the Sun Bowl provided jersey made by Champion. So, the one player who actually wears sleeves you can put full wrap-around stripes on… and he doesn’t use the proper stripe pattern that the throwbacks are supposed to have. Ugh. * started with gray facemasks on our navy helmets… then when it was time to order colored facemasks, the first batch were royal, and rather than order new matching facemasks Delaware kept the mismatch until KC Keeler changed the helmets to all-royal in 2002. Forgot to say: Coaches Nelson and Raymond presided over our program for 50 years. do the Browns and Titans get to do this week 14 since they are on bye this weekend? Good question. I think the answer must be yes, because I’ve seen the custom design for a Titans player. Will find out for sure later today or tomorrow. Now confirmed: Titans and Browns will get to wear the custom cleats in Week 14. Love the WHL jersey article. One thing to point out. The Lethbridge Hurricanes were named in 1987, ten years before Carolina. Its a weird nickname for a prairie city, but Lethbridge is on the eastern edge of the Rockies and gets comically strong west winds for a lot of the year. The new logo reminds me of Hilton Hotels. -The Portland Winterhawks wearing the same uniform as Chicago has a back story. The original Winterhawks, after moving from Edmonton in the 1970s, wore used Chicago Blackhawks jerseys. 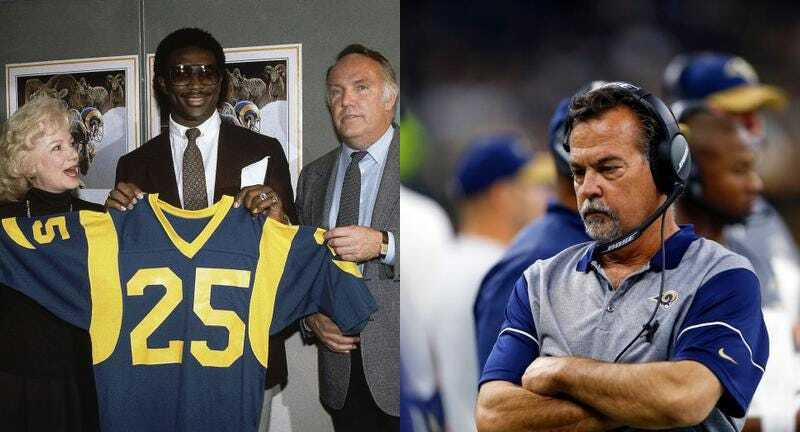 They were handed down due to a relationship between the owners of the two teams. The original jerseys still had the “C” shoulder patch. The Winterhawks eventually made minor alterations, switching to “P” shoulder patch. As well, there are differences now when you compare the main crest with that of the Blackhawks. Of course, back in the 1970s, it was the Winter Hawks and the Black Hawks. Winterhawks did copy Chicago with the name alteration to one word. -The Everett and Regina jerseys in the blog are old. The Everett design is still the same but the logos have been changed this year. Regina last wore those uniforms 2 seasons ago.